Ideal for presentation and collaboration, a Clevertouch Interactive Flat Screen will make life at the office easier. It is so intuitive and easy to use that anyone who can master an iPad or tablet will be able to use it in no time. The Clevertouch screen has a number of advantages over the white board and projector used by many companies. The main one is that it doesn’t break down. You only have to look at it to see how solid and technically sound it is. Also it is faster and more efficient. It doesn’t need a window blind as it is built with special anti-glare technology. It is much more tidy and self-contained. The imagery it displays is much brighter. It is more versatile. All in all, it is a much more powerful, attractive piece of machinery. 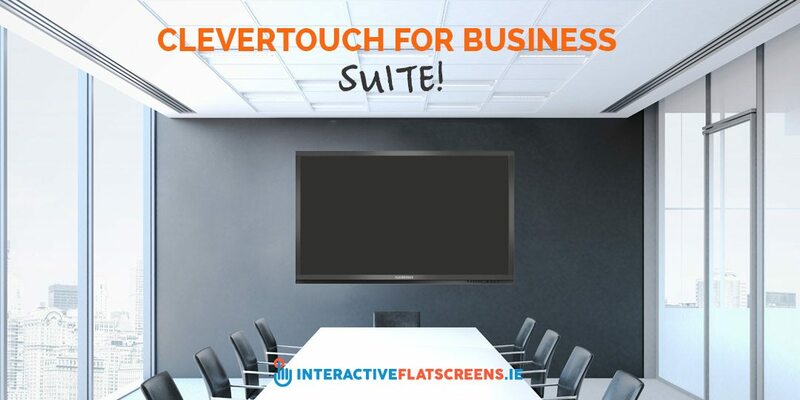 The Clevertouch Interactive Flat Screen comes with a suite of business software products. Snowflake Business allows you to give presentations and collaborate with your colleagues efficiently by allowing you to connect multiple devices and share and discuss. LynxPro Meeting is an annotation software which is perfect for conferencing. It simulates handwriting and paint brushes as well as allowing you to import Office documents, pdfs, images and video into your presentation. DisplayNote is a powerful software which facilitates collaboration. Share presentations directly with your colleagues by having them connect using the application on their IOS, Android or computer. Participants can save and make notes. The presenter can view and share the screens of connected participants and invite them to contribute to the session. It also allows the presenter the freedom to circumambulate as he/she makes their presentation. In the business world, two heads are better than one. This is why the Clevertouch suite is so useful: it encourages and facilitates collaboration. Think of it as like a band of musicians. They bounce riffs and ideas off each other until they come up with something worth keeping. Ideas are hard to come up with so collaboration and discussion are important parts of the business culture of most companies. Working as part of a team is made so much easier with Clevertouch Interactive Flat Screen Technology and software. It leads to efficiency which frees up employees for other business tasks. Whatever your presentation needs, you’ll find what you are looking for in the Clevertouch suite of business apps. So much can be done with them that they will put the excitement back into the business presentation or meeting. If you are feeling nervous about giving a presentation, there is no need with the interactive flat screen. Just let your finger and the screen do most of the work for you and your presentation will go smoothly and easily win the admiration of your colleagues. The interactive flat screen is just as powerful a tool in the business environment as it is in the class room. Its ability to share with smaller devices will stimulate discussion and help give birth to ideas. Its easy to use, intuitive interface will lead to efficiency. Its superior build quality will ensure a very long, trouble free life. 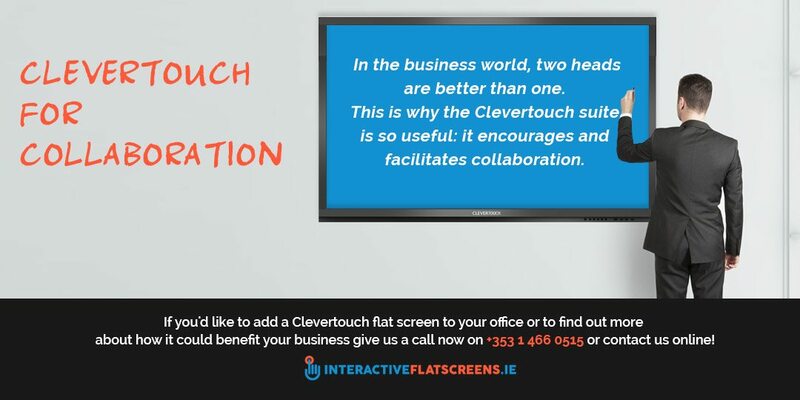 If you’d like to add a Clevertouch flat screen to your office or to find out more about how it could benefit your business give us a call now on +353 1 466 0515 or contact us online!